So`I ordered the raxiom halo fog lights , still debating on their headlights so I'm staying with stock for the moment. 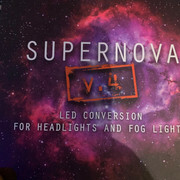 Once i get the supernova V4 in ill show what the stock beam pattern looks like with the supernovas. Now onto the GTR 9005 LED inside the stock housing. When you seat the bulb like normal the OUTPUT is horrible nothing like the top picture. 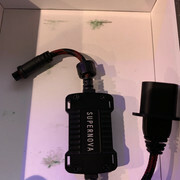 After looking at it i see the issue the LEDS shine Up and down thus its being blocked the those like pieces on metal inside the housing. Ironically tho if you turn the bulb as if you were removing it the LED's Shine side ways and give the same exact look at the top picture. Last edited by Code2; 01-11-2019 at 01:20 AM. you'll have a few months to wait LOL car is in the garage not moving in Chicago weather, nor driving as long as there is midwest destroys everything it touches salt on the ground. Ok, So these are the SuperNova? "What happens in Vegas, Stays in KITT"
Since when is 6 lines a mini novel? That's why its a bit of a review people asked and I did it since I was doing it already, if simple reading and comprehension is two much I don't know what else to say. I'm not into coddling folks that cant take the time to briefly read a few post and rather have a short story picture book handed to them. Sorry if it sounds harsh but Im not one for wanting anything handed to me, I took hit on expense and taking the time to do the work, blindly spent the money and then take the time to post to help others at the very least one could take a moment and read after all it was free. But I get the gist of how it seems to be here. Ill keep the knowledge to myself from now on. BTW youre welcome mind you I also took the time out to grab shot of the output for you to see since you asked for one from inside which was not possible so the next best think was provided. Last edited by Code2; 02-07-2019 at 04:16 AM.